The iClear 16 by Innokin brought the replaceable coil concept into e-cigarette to satisfy growing vape needs. 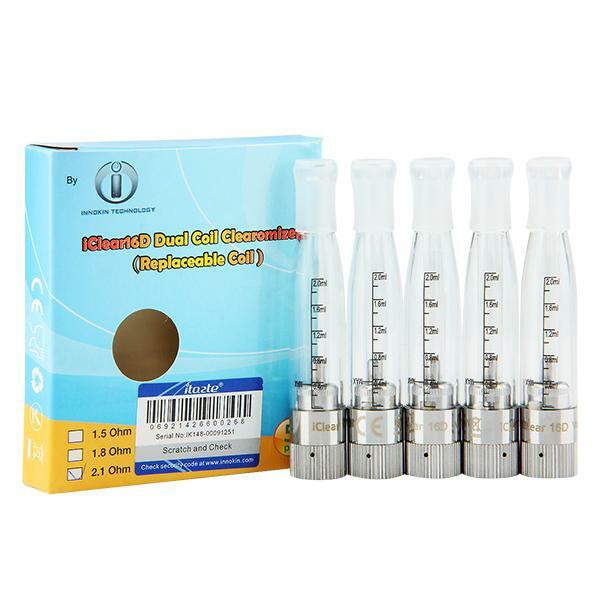 The dual-coil technology of iClear helps to heat e-juice well enough to deliver better flavor while the BDC technology ensures the wicking well saturated. • It is eGo thread, compatible with 510/eGo/eGo-T/eGo-C/eGo-C Twist battery. • Quick Link: Replacement coils . Very happy with the Innokin iClear. Amazing flavor and no burns. I have checked the authenticity on official site and it's original. Die Cigma ist smart, schön schlank und gut im Handling. Innokin iClear ist gut. Sehr schnelle Lieferung, Produkt gut verpackt.